I got my photos back and there were things on there that I'd forgotten. I'm forgetting a lot of things these days. I blame the surgery. Or the pain killers. Or the pain. Or the season. Or my age. Oh pick one from each column, it could be anything but forgetting what I'd taken pictures of is the least of what I've forgotten. One day I got out of the shower and realized that I'd forgotten to wash certain very important parts of my body. If you see me out and about without my glasses or my pants please help me out. Anyway, it turns out I took the advice of a number of photographers who specialize in children's portraits and wasn't afraid to take a lot of shots of my young subjects. You'll see them over the next couple of days (not just this kid, I got me another one, too). This one was basically a test shot as we stood in line just before we entered Santaland proper. As I hit the shutter she struck a pose and I had a couple of relatively uncharitable thoughts about her since I'd been hoping for a candid shot. Not sure what I was thinking, someone's crammed into a 3 foot wide corral with you, pointing a 50lb camera in your eye and you're going to pretend you don't notice? Turns out this is probably my favorite shot of the day of my smirky little lady. 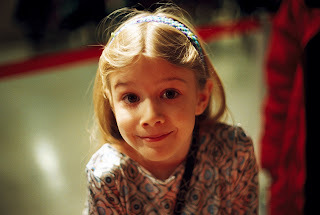 She has that Dakota Fanning innocence about her, doesn't she?